As sea waters slowly rose around his temple and his neighbours fled inland, Thai abbot Somnuek Atipanyo refused to budge and is today a symbol of the fight to restore the country's fast-eroding coastlines. A dangerous combination of climate change, industrial farming and rapid urbanisation are endangering the Gulf of Thailand's coasts, stripping away precious mangrove trees and leaving some buildings like Somnuek's surrounded by sea water. 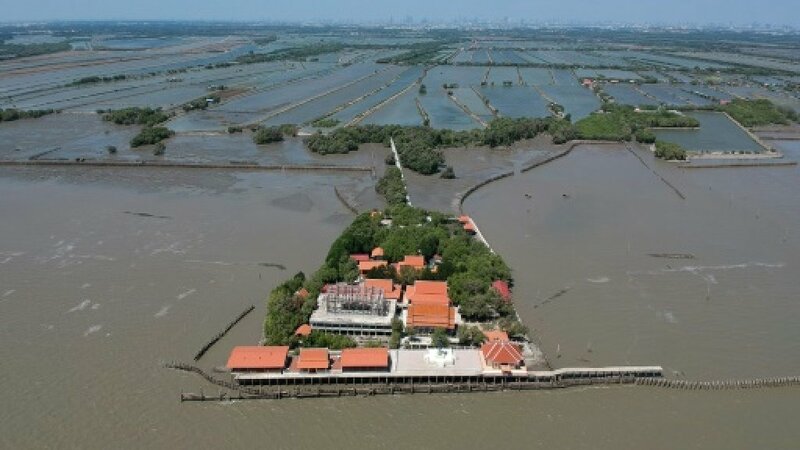 In the 30 years since the waters started encroaching, most of his neighbours in the fishing village of Samut Chin moved several hundred meters inland to rebuild their wooden homes. Standing in his saffron robes near his monastery on stilts -- dubbed the "floating temple" -- the 51-year-old monk points out to sea at the spot where the local school once stood. "This temple used to be in the middle of the village," he tells AFP in Samut Chin, about an hour south of Bangkok. "If we moved it, people wouldn't even know there had ever been one here," he says of the temple, accessible only by a small footbridge today. These shores were once protected by extensive mangrove forests -- the Gulf of Thailand boasts some of the largest in the world -- a natural defence against coastal erosion thanks to their extensive roots that stabilise the shoreline. But it's a been a losing battle to preserve them. Mangrove forests have been cleared for extensive development of shrimp and salt farms, along with new houses and hotels that have popped up thanks to a development boom in recent decades. Thailand lost almost one third of its vast coastal mangrove forests between 1961 and 2000, according to a report from the nation's Department of Marine and Coastal Resources and the UN Environment Programme. Climate change is also having an impact: stronger waves and more ferocious monsoons have wiped out mangroves in the Gulf of Thailand, which is especially vulnerable because its waters are so shallow. "The waves and tides are higher than before," said Thanawat Jarupongsakul, who advises Thailand's government on its policy to combat erosion. Asian and Caspian coastlines are the two areas in the world most affected by coastal erosion, according to a study published last year in the scientific journal Nature.